I found Pearl while looking for Dennis Dottin. Dennis is our cousin on my husband's family' paternal side. Dennis Dottin is the relative of Mrs. Annie Sullivan (Webb) Who married Arthur Webb (1st great grand uncle of my husband. While looking for him, I of course went back to the original connection Arthur Webb and sadly upon finding out that all 3 of his children had passed very early. 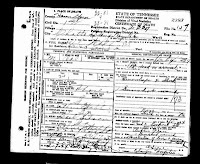 As the informant on the death certificates it was discovered that their mother was a Mrs. Pearly Gibson Webb married to Arthur Webb on 19 Jan 1908 in Crawford County, Georgia. So finding my great grandfather Charlie Smith has been quite the journey. I found lots of Charlie Smith's in the Oglethorpe/Athens area of Georgia in 1930, but they were all marked single and with the name Charlie, I mean really G-whiz. Being that my paternal side is Jones/Smith, I have found I could literally be related to any and everyone. At first I was under the impression that he died in Athens. My Paternal side (My lovely and sweet aunts) remembers his children fondly and vividly and they knew His name and his living situation. Side step: This situation is different because our grandfather ran away and lived in a shed at the age of 13 after disagreements with his treatment by his stepmother. His mother was by some accounts deceased when he was a young child. (Although, I have theories on that I will share later)Therefore, as you can imagine the relationship had its challenges.